Brug tussen Suid-Afrika en Mosambiek is voltooi in 10 November 2018. Die Chinese deel geld uit soos geskenkpakkies in Afrika lande – Suid-Afrika ingesluit. Hulle is nie net van 2018 hier in die land betrokke nie , maar geruime tyd. Hulle word selfs onder swart bemagtigingswetgewing bevoordeel bo die van blankes en selfs ander etniese volke. Ons het onlangs ondervind hoe sekere groot gebiede plaasgrond, aan die Chinese belowe is vir eie provinsie daar in Limpopo – onder die vals vlag van “grond onteiening” – Ramaphosa. Nou is dit ook Mosambiek se beurt. The longest suspension bridge in Africa has been officially opened to the public, following four years of construction undertaken by the China Road and Bridge Corporation. The Maputo-Catembe Bridge was inaugurated by the President of Mozambique, Filipe Nyusi, on Saturday 10 November. 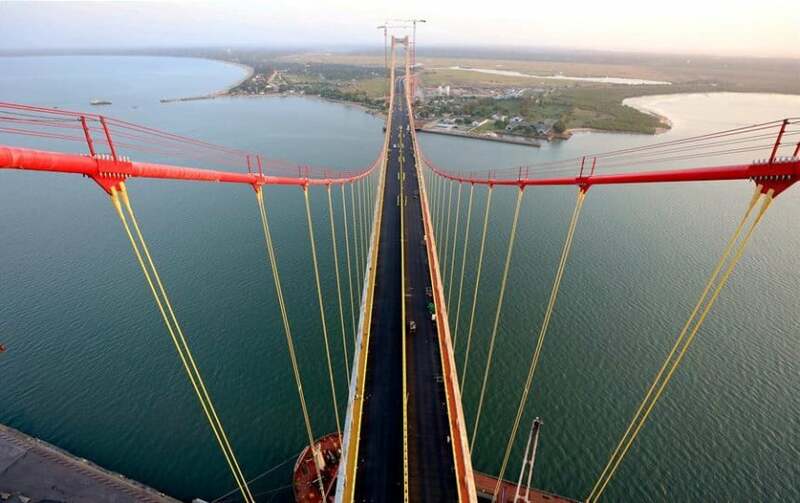 The three-kilometre-long suspension bridge, which extends 680 metres over Maputo Bay, has been lauded as a Southern Africa’s latest and greatest engineering feat. It is a fact, “expropriation” land in South Africa, was promised to the Chinese people (Limpopo). The Maputo-Catembe Bridge straddles the Indian Ocean inlet of the Espirito Santo estuary, hovering 60 metres above the azure waters below. Over four years, China funnelled $785 million into the construction of the Maputo-Catembe Bridge. Crossing the bridge will cost locals $2.60; an exorbitant amount of money by Mozambican standards. According to various media reports, financing relating to the Maputo-Catembe Bridge project was granted as a loan agreement to the government of Mozambique. While the conditions of these loan agreements are not public knowledge, economists have expressed concern regarding African countries, including Mozambique, over-indebting themselves to Chinese interests. China has just offered Africa another $60 billion for emerging economic developments, but is this a slight of hand aimed at funnelling out the continent’s resources, or is it a sincere gesture of assistance? 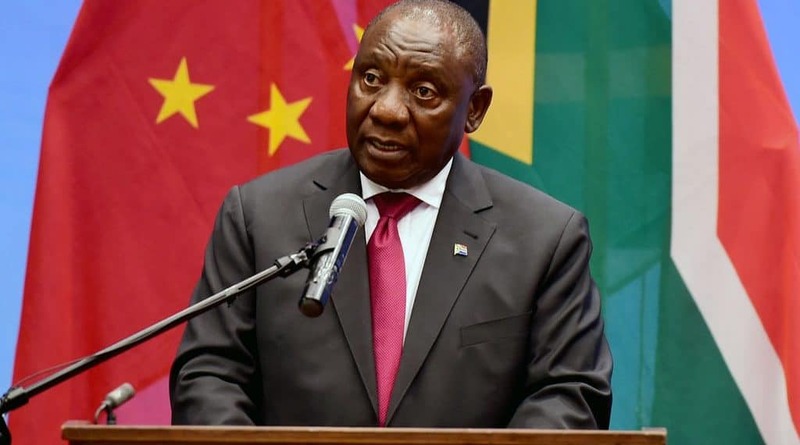 South African President, Cyril Ramaphosa, has vehemently denied accusations insinuating Chinese neo-colonialism taking root in Africa. Even Chinese President, Xi Jinping, rebuked the notion of ulterior motives, telling African leaders his country’s investments in the continent have “no political strings attached”. In August, China pledged R196 billion to South Africa, during the 10th annual BRICS summit which was held in Johannesburg. A portion of these funds is set to assist embattled state-owned enterprises, Eskom and Transnet. While foreign investment in South Africa is surely appreciated, especially considering Ramaphosa’s target of $100 billion, questions regarding the payback have not gone unnoticed. “If the President is confident that the agreement is in the best interest of the South African people, he will surely accede to our request. The latest loan agreements were tabled at China-Africa summit. Besides the multi-billion dollar investments, Jinping added that some outstanding debts afflicting poorer nations would be scrapped. But according to economic analysts, China’s neverending loans could lead Africa down a slippery slope of unpayable debt. In the last 18 years, China has pumped more than $124 billion into Africa, while the International Monetary Fund has warned of increasing debt distress in 15 African countries. So, what happens when African nations inevitably default on their repayments to China? Let’s take a look at the Belt and Road project. Spearheaded by China, the initiative aims at growing ‘connectivity and cooperation’ between other countries. This multinational scheme is aimed at addressing an ‘infrastructure gap’, by investing and loaning huge sums of money to partner countries. But, it seems China’s new ‘Silk Road’ has run into problems surrounding mounting debt and cries of neo-colonialism. Unfortunately, poorer countries are often too eager to get their hands on the money. Take Sri Lanka for example; the nation snapped up a Chinese loan which has now resulted in debt exceeding $13 billion. Unable to settle its ever-growing debt, thanks to burgeoning inflation rates, the small island nation was, in effect, forced to sell Hambantota port to the Chinese. The port, which was constructed by the Chinese, with the use of Chinese funds and labour, is now a Chinese-controlled naval base on foreign soil. But Sri Lanka isn’t the only nation to have surrendered a portion of its sovereignty – China has helped finance at least 35 ports around the world in the past decade, with 14 of those constructed on African shores. The list of nations burdened under the weight of Chinese loans continues to grow. Pakistan, Djibouti, Maldives, Mongolia, Laos, Montenegro, Tajikistan and Kyrgyzstan are all struggling to repay loans, with the Center for Global Development referring to the situation as ‘unsustainable’. While many African leaders have rubbished claims of debt-colonialism as nothing more than a scare tactic aimed at harming African-Chinese interactions, Aly-Khan Satchu, an economic analyst based in Kenya’s capital, Nairobi, told Al Jazeera the concerns over “debt-trap diplomacy” were “real”. “There are worries that this infrastructure has been inflated in price, and that it is highly unlikely to make a return on investments that is necessary for these countries to get in order to pay back the debt. “I can’t help but wonder why the money is ‘money pie’ when it is offered by the Western countries but ‘money trap’ when offered by China? Isn’t it a glaring double-standard? By funding infrastructure and other areas that lag behind for a shortage of money, we have helped the relevant countries break bottlenecks, enhance their capacity for independent development, realize social and economic sustainable development, and improve people’s livelihoods.